This week, it's The Fantastic Four (plus Doctor Strange) vs President Lyndon B. Johnson - flying high like Superman - in Superbird from Country Joe and the Fish's Electric Music for Mind and Body. This always stands out for me, as the idea of Reed and Stephen alone vs Kal-El makes for some pretty powerful visuals - like all psychedelic rock should generate. 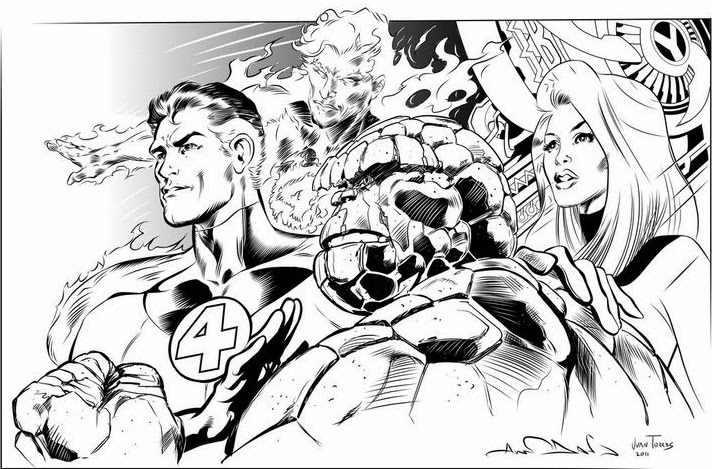 "What is more I got the Fantastic Four and Doctor Strange to help him on his way!" You are the man for finding this true classic gem from the 60's Dan. Yo da man. Never heard this is either, but political much? Good lyrics, and even better Alan Davis art. I had a list somewhere of lots of superhero lyrics in songs and must look for it. Alan Davis ... thumbs up. Thanks guys - glad you liked it! Yeah Dale, it's pretty political, but politicians still listened to the public back then so it works right :) Karl and OA, I think Alan Davis on the Fantastic four was a brilliant move by Marvel in Heroes Return, and while that run never lept that many hurdles, every time he draws the Four or their cast, it's always an instant 'save'. This is to much popular for kids. Thanks for your good thinking. I like your creative work very much. But one think your video is not working. Please add more videos.